About 120 black Riga type boxes here found in Jürgen's former home in Wetzlar. 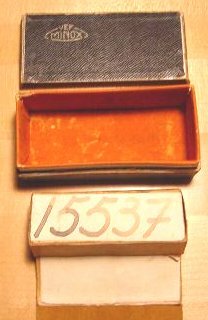 These boxes are un-marked and differ from either the VEF-Riga boxes or the later Minox A black boxes. It would appear these may have been for the abandoned post-War production of Riga-Minox cameras in Wetzlar. Unfortunately these boxes and reproduction cases are now being sold without disclosing the source, making the camera look more authentic than it is.